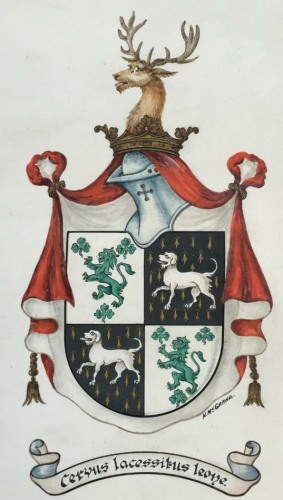 Lyon & Turnbull of Edinburgh are offering for sale Lot 124 the Confirmation of Arms to Thomas Roderick O’Connor of Rathnew and Clunygrassin the County of Roscommon and of Dalton in the County of Northumberland by Capt. Nevile Rodwell Wilkinson, Ulster King of Arms dated 9th August 1910. The auction is set for 17th May 2017 with a sale estimate of £100 to £200. Arms: Argent an oak tree eradicated proper supported by two lions rampant combatant Sable in chief an ancient Irish crown Or and base three lizards passant to the sinister bar wise Vert. Crest: Out of an Irish crown as in the Arms an arm embowed in armour the hand grasping a sword all proper mantled Gules doubled Argent. The Confirmation was on the basis of his descent from the Rev’d Thomas Sheridan (b.1687 d.1738) who married Elizabeth McFadden the only daughter and heiress of Charles McFadden of Quilea, County Cavan. 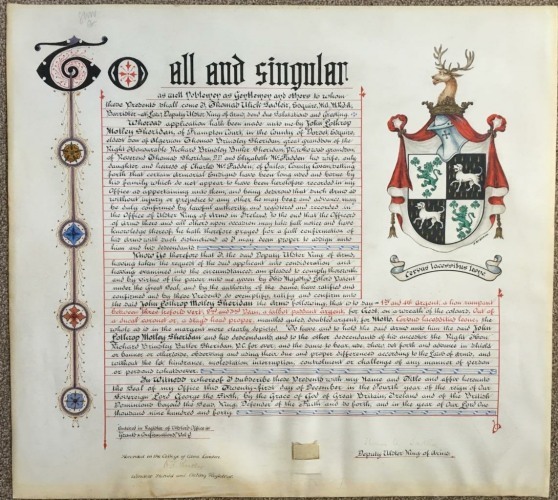 The Confirmation is signed by Thomas Ulick Sadleir, Deputy Ulster King of Arms. Arms: 1st & 4th Argent a lion rampant between three trefoils Vert (for Sheridan) 2nd & 3rd Pean a talbot passant Argent (for McFadden). Crest: Out of a ducal coronet Or a stag’s head proper.